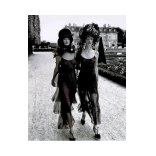 Steven Meisel - GALERIE SUPPER is specialized in contemporary art. Steven Meisel (b. 1954, New York City) studied at the Parsons School of Design before he became the main photographer for the Italian Vogue, for which he regularly shoots since 1988. His photographs have caused many controversies due to their sexual explicitness. Just as Peter Lindbergh, he has been involved in the creation of the “Supermodels”, a new generation of models becoming popular in the late 1980s.